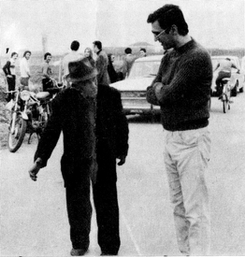 On the left "Bepi Zocoeta", on right hand Franco Andreetta, while mayor of San Polo. The history of discoveries and excavations of Roman aqueducts of San Giorgio is truly unique and exciting. In 1903 the maestro Antonio Gardin conducted the first excavations rediscovering the aqueduct, while a young lover of the past saw the water, this is Giueseppe Zaninotto (better known as "Bepi Zocoeta”). Over the years the people forgot this important asset in the subsoil and Bepi told his stories, that seemed more like legends: we still talk of a tunnel underground that no one had ever seen. But Bepi continued to assert that there was anything but a legend! 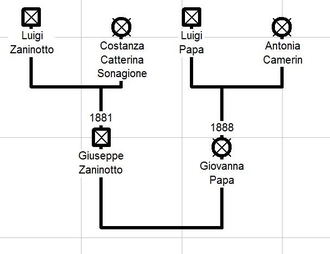 Zaninotto Giuseppe (nicknamed Zocoeta Bepi) was born in San Giorgio March 20 1881 at 2 a.m., he was the son of Luigi Zaninotto and Sonagione Costanza Catterina. Bepi said to have had in elementary school the teachers Antonio Gardin, and that he have repeated the first class for six times! "I was the smallest," he says "and everybody blow me, both by classmates and teachers. "At 12 years interrupted his studies and goes to work in Papadopoli farm for 40 cents a day, he makes the waiter and cook. Sometimes he had to prepare meals for more than 40 people. In 1898, when he was 17, he emigrated to Germany in Duisburg, where he worked for a company that realized gas street lighting throughout the city.In 1902 he went to Austria where he remained for a few months. A few years later he moved to Berlin, where he continued to work in the field of public works, works on installation of larger pipes for water, where you sometimes need to dig up to twelve meters deep, works six days a week, but Sunday, after going to Mass, he used to go to the Island Museum (Museumsinsel), located in the river Spree in the heart of Berlin. He went to visit the Egyptians, Greeks and Mesopotamian museums, the entry cost him two marks, this is the first outstanding example of the deep cultural interest of this character, born and raised in our campaigns. In 1903, when he was 23, excavated the ancient aqueduct, digging in a precise place where the vine and the grain is drying up, decided to find the cause of this problem. 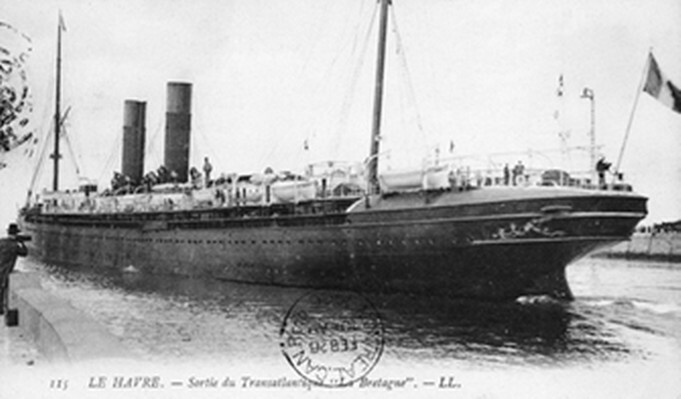 In 1908, given the precarious situation in Italy, decided to leave the United States in search of fortune, at 28 years he follow the footsteps of his cousin Domenico Cesana, leaved about a month before him for the United States.Bepi left the port of Genoa, he sailed on the transatlantic "La Bretagne", flying the French flag, which subsequently affects Naples and Palermo headed to New York, he arrived after 22 days of travel. In Cincinnati (Ohio-USA) for two consecutive years working at coal mines. Hard work and dangerous.The coal is mined to 1125 feet above sea level and subsequently transported downstream by wagons pulled by mules.Wells often occurred firedamp explosions and death was so close that at times even seemed to smell his breath. "Bepi" is described by the Americans who used to keep a file with the character identification of a person, all landed at Ellis Island, an island near New York where there were controlled documents and status of persons, reached the mainland by ferry after being accepted. Bepi, as shown by his pictures was not very high (1.61 m), had dark complexion brown hair and eyes blacks, was a laborer by profession and was able to read and write, and being in Germany also knew German. But we also know there were : Fantuzzi, Cesconetto, Urpandi, and Costariol families from Ormelle, and from San Polo di Piave there were the Ambrosetti, the Cusin and Bernardi families. Told, the good Bepi, that one day received an invitation to the wedding of a neighbor who lived in California, he took the train and in 5-day trip through the prairies and Rocky Mountains, reached him, he participated at the wedding, with the secret hope of finding a job less cumbersome and risky, but unfortunately he didn’t finding it, and decided to resume the train and return in West Virginia coal mine. At this point he returned to Italy, aboard the "Venezia" ship and arrived in Genoa in 1910. On 17th February 1912 he married in San Polo di Piave, with Giovanna Papa, born in 1888, wedding witnessed were Zorzal Angelo and Ongaro Gaudenzio. After marrying Bepi leaves again for the United States where he arrived on June 13, 1913, but this time alone.He leave from Genoa with an ocean liner called first "Mendoza" then "Caserta". In America, a few months later, comes the news that he became the father of a beautiful child, which was imposed in the name of Gemma. Built by Armstrong, Mitchell & Company, Newcastle, England, 1904. 7,028 gross tons; 420 (bp) feet long; 51 feet wide. Steam triple expansion engines, twin screw. Service speed 14 knots. 1,630 passengers (130 first class, 1,500 third class).Two masts and one funnel. Built for Lloyd Italiano, Italian flag, in 1904 and named Maritzburg. Launched as for the Bucknall Steamship Company, British flag service. Completed for the Italians as Mendoza. Transferred in 1904 and renamed Mendoza. Italy-South America and later Italy-New York service. 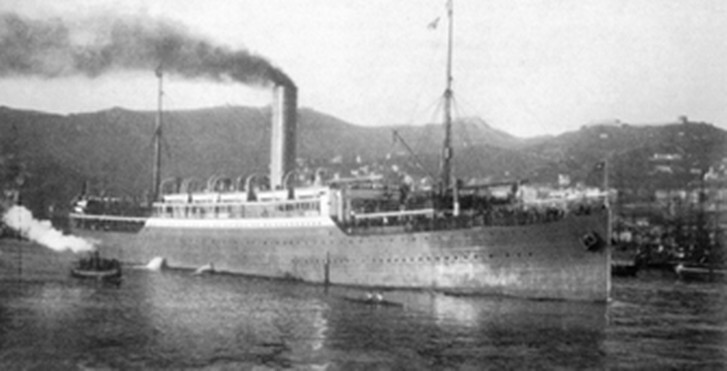 Renamed Caserta in 1913. Sold to La Veloce Line, in 1923 and renamed Venezuela. Scrapped in 1928. He return to Cincinnati (Ohio-USA), with the help of his cousin Domenico Cesana. Wert Siscth 6th Cincinnati Ohio USA. A year and a half later, October 29, 1914, he returned to Italy (with the ship Cesare Augusto) with a nice nest egg: 400 pounds.A capital. Following the outbreak of the first World War, returned to Italy, he was sent to the front, taken prisoner, lying in a prison camp in Hungarian territory, and at the end of the war he was finally released and could return to Italy. He fix the house.He had another daughter: Noemi.Resumes to work in Papadopoli farm.Between the first and second world war he visited his brother in San Nicolas, in Tierra del Fuego, Argentina. The period of life adventurer is over.From now on he lives a quiet life: no more trips abroad. Its boundaries have now become the neighborhood. Bepi died in 1978, at 97 years old, but actually remains his legend. The Bepi story of the roman aqueduct discovery begins in a normal summer morning in 1967, he was 87, when at seven in the morning, he came to the house of Franco Andreetta, mayor of San Polo di Piave, and handed over a piece of cardboard cut from a box of detergent design of the aqueduct, as he had seen in 1903. 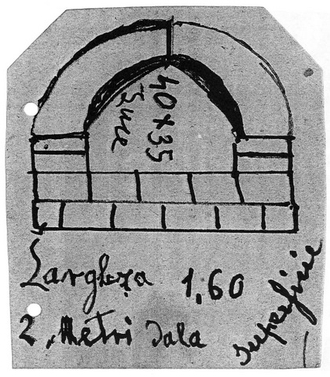 Well, after 64 years Bepi Zocoeta remembered exactly all the details and measures of the aqueduct, as confirmation that the card was retained by Franco Andreetta. Until then everyone had made fun of Bepi, not believing his words telling every feast of St. Martin(November 11). The coincidence want that Franco Andreetta had as work colleague Lorenzo Piacentini from Udine, grandson of cav.Gaetano Rossi. Cav.Rossi around 1930 had drawn up the boards with a hypothesis roman centuriation of San Giorgio, he also indicated in these tables the aqueduct. In 1972 Franco Andreetta went to the house of the colleague, who still retained the valuable material. 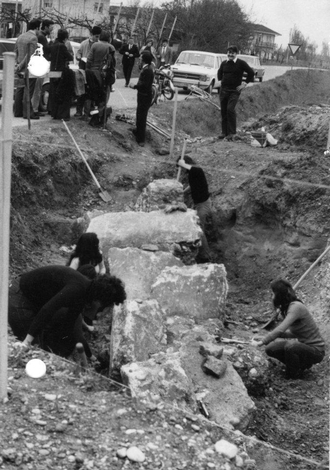 In 1973 excavations were carried out by a group of young people of San Polo, on his third attempt found the much sought aqueduct, then the excavations continued by the Archaeological Group “Opitergino”. Bepi had brought to light, even to knowledge, the precious roman aqueduct. As mentioned the historic relic was discovered almost by accident.Bepi had indeed noticed that the screws and wheat, in a precise point didn’t grow and dry himself.He had also noticed that the water disappeared in that stretch of land, with remarkable speed.He decided to find the cause of everything.He began to dig a good pace.Just 40 centimeters deep he discovered a wall built of stone and lime dipped in a compact and sticky yellow clay that hampered the effort because he clung tenaciously to the blade. He continued his works for a couple of weeks during which he dismounted ten meters of the aqueduct, whose background was discovered to be composed of two layers of bricks sesquipedalian. The news of the discovery reached the ears of Cav. Gaetano Rossi, student of archeology, which was gathering finds and reports of finds of Roman objects.The Cav. Rossi was interested in the red clay bricks on which there were written or numbers.This is because the "factories" of bricks then used to mark a special sign with their production.And each had a furnace. Not only Cav.Rossi, but his old school teacher Antonio Gardin went to look, he too keen archaeologist. Bepi didn’t content just to see the section of aqueduct which had on him soil.Curiosity prompted him to do some tastes, three for the accuracy, arranged in a straight line with the first discovery, later, towards the church of San Giorgio. His idea, that the aqueduct or whatever it was, "walked" in a straight line was supported by the finding in different places, as they stopped at the Church of the back of the building, always composed of stone and lime. 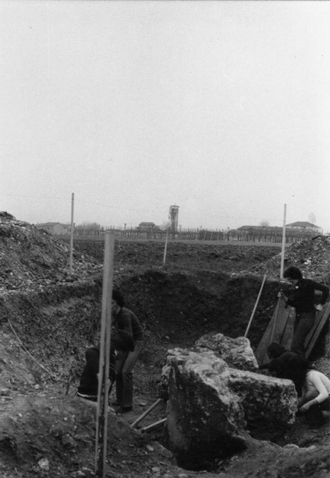 He also found a coin of copper or bronze during the demolition of that section of the aqueduct.On one side was the inscription "PIUSI and glimpsed a head.Other side was too worn to see something.Was almost oval shape, perhaps because of centuries during which it was buried under the ground.We must add that the money was accidentally found by her mother. He sold his money, not without regret, to Cav.Antonio Benetti from Oderzo, who gave him 50 pounds.To understand what this capital represent just think that a lot of corn a ton then cost 7 pounds. In San Polo played the football team after the game went all to drink at the bar "da Stefani," where there was also Bepi, now white-haired, hunched, wearing a hat and a jacket. And Bepi alluding to prominence on the neck which had said: "Màl pàr chi l’à e patate da cavàr!" Bepi, who had long lived in America, began to do the carpenter and at that time his works were often bartered with food.He bartered for peanuts with a job, also known as Peanuts, best known in dialect as Bagigi or Barbagigi.Well, Bepi gave to all children, who looked thoroughly before eating, because Bepi told them that these peanuts came from faraway America! Bepi was accustomed to sit next to an old trunk of a tree felled.Looked at people who entered the street knew before if you would stop or not to give him a greeting.While reading the paper, he used to turn it upside down, putting in considerable embarrassment to the people before him who saw him sitting with his glasses to read groped, could not laugh and sometimes had the fear of pointing out that the newspaper was the reverse.With this method Bepi studying people, very understanding of their personality. Bepi at 93 years quietly remembered phrases and rhymes in both German and English. 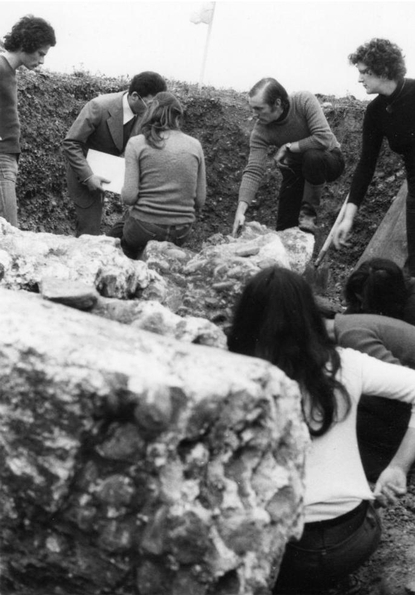 In May 1974, arrived in San Giorgio some German visitors, Bepi made their guide illustrating the excavations. At one point he turned to the German lady asking in English: "Do you like me?" Ms replied: "Yes, of course."